The environmental movement was never my movement. I grew up in a part of the country where we recycled and composted before it became more mainstream, and where you could buy “green” just about anything. Yet listening to presentations on green fashion and chemical-free cosmetics, I had the distinct impression that this movement cared more about saving paper than it did about saving people whose lives were regularly at stake in the here and now. So I dismissed it and turned to feminism. And during the decade since then, feminism has never steered me back. It’s brought me to learn about all sorts of other intersections that women experience — police brutality, immigration, reproductive justice — thanks in large part to the tireless work of women of color. But while we’ve been working on state violence and institutionalized misogyny, climate change has accelerated at an alarming rate and our planet is in real danger. 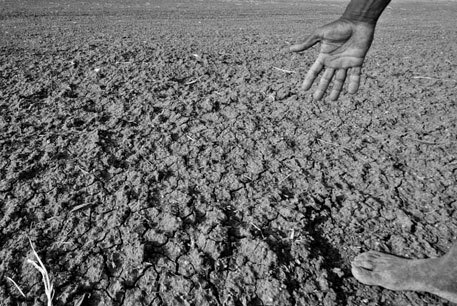 Scientists widely agree that if the earth’s temperature increases by more than 2 degrees Celsius, we are inviting climate catastrophes like super droughts, mass extinctions, and extreme sea level rise. By 2030, climate change could force another 100 million people into extreme poverty, and I guarantee you that women will make up the majority of them. 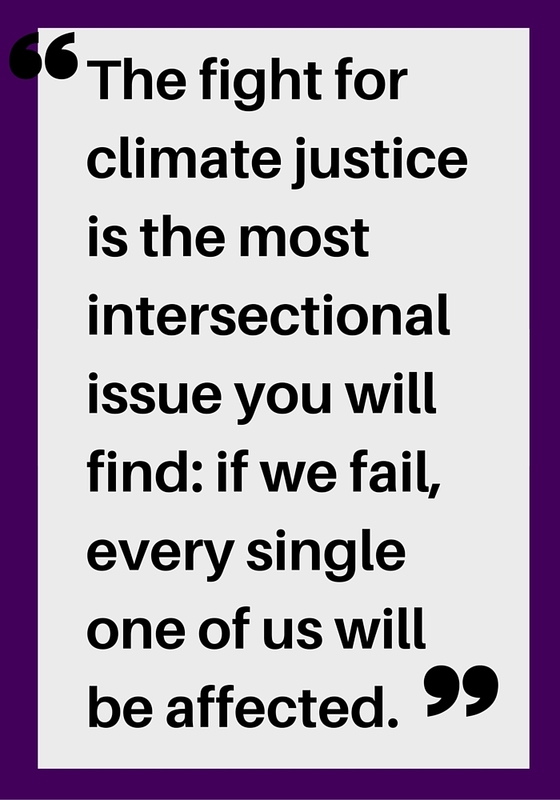 The fight for climate justice is the most intersectional issue you will find: if we fail, every single one of us will be affected. But some more than others. I’ve written before about how climate change and extractive industries already disproportionately affect women and marginalized people, how women make up 70 percent of the world’s poor today and therefore have fewer resources and less mobility to respond to climate disasters. They are often responsible for gathering food and water, and when those supplies are threatened, they are more likely to sacrifice their diets for others. Climate disasters often put a strain on existing social support networks, and women are most frequently called upon to care for children and the elderly during those moments. These facts are compounded for women of color and particularly indigenous women, who are more likely to live in regions impacted by pollution, drought, and rising sea levels. In many countries, indigenous communities also reside on some of the most heavily-contested oil and mineral deposits, and are victim to repression and violence at the hands of government forces or multinational corporations. They are on the front lines of climate change, but they are also on the front lines of the battle to stop it. Because of this, indigenous peoples from around the world fought to have a presence at last year’s 20th Conference of Parties on the Kyoto Protocol (COP20), a summit organized by the UN to address climate change. Women talked about the impact climate change was having on their communities and demanded that global leaders take immediate action to reduce greenhouse gas emissions. And this December they will be back for COP21 in Paris, the goal of which is to produce the first ever legally binding universal agreement on how to address climate change, signed by all nations of the world. Indigenous communities and allies have long been fighting powers ten times their size in order to defend our planet. But for their movement to work, people outside of it have to bear witness. When attacking big superpowers like this, it’s not enough for a few people to get arrested for blocking a coal ship for a few hours. Those two people need fifty more people standing on the loading dock in solidarity, one hundred more people Tweeting and Instagramming it, and thousands more signing online petitions, calling legislators and exploding the reach of their message. The movement for climate justice needs megaphones so that the actions of a few people can reach millions of people. And when millions are watching and taking the lead from those most affected, global leaders will have to listen. In that vein, I’d like to introduce “Bearing Witness,” a short series on indigenous women throughout the Americas who are fighting for climate justice. For the weeks leading up to the Paris summit, I’ll be covering communities across the continents who are facing the worst effects of climate change, resource extraction, and energy projects, yet still standing up to protect our Mother Earth. Our Pachamama. Naomi Klein argues in her book This Changes Everything that mass mobilizations are all that can save us now. She’s right. Until every single one of us gets serious about climate justice, women will continue to lose their homes and often their lives. If we feminists want to ensure that there is a planet on which we can challenge misogyny and fight the patriarchy, a place where women can live safely and equitably, then this is our fight. This is our movement too. Join us and follow along with #BearingWitness.